Tickets for this film are available for purchase at the venue. Khushboo has had experience in the fields of journalism, graphic design and writing for a number of years, before she moved to filmmaking. "Continuum," a short film she wrote and directed at the age of 20, won the best short film at the Hannover Film Festival. She next co-wrote the internationally acclaimed fiction feature film “Ship of Theseus.” Her versatility gave rise to her latest projects, “An Insignificant Man,” her first feature documentary film, and ‘Right to Pray’, a unique virtual reality experience, the first of its kind from India. Both films are set to premiere at TIFF 2016. ​Anand is a filmmaker and a media producer, deeply interested in philosophy, evolutionary psychology, innovation, design and magic, and occasionally dabbles in all of these. His last film, Ship of Theseus premiered at the Toronto International Film Festival in 2012 and received wide international acclaim. ​We established camaraderie with the party and its members very early, and have closely followed their journey. Our access within the party gave us an insight into the mechanisms of politics through very interesting protagonists. It also showed us the vulnerabilities of such an enterprise. Today the Aam Aadmi Party is the center of much debate. We are neither looking to make heroes out of them for being protestors nor wanting to vilify them for being politicians. Our film tells a story that resonates with universal concerns about democracy. Our attempt has been to construct a nuanced portrait of the various forces shaping democracy, the biggest of which is the voter. In the AAP story also, the voters are a major character, as they interpret the power that elections give them, often negotiating with likely candidates on the terms of casting the vote. 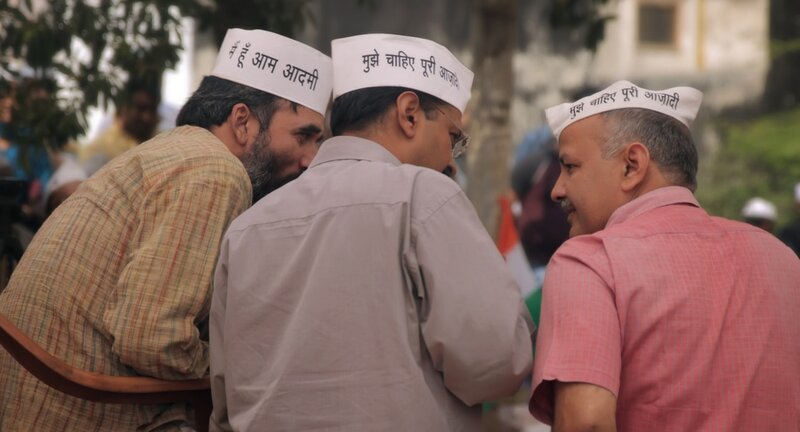 The AAP is a vehicle to arrive at a better understanding of electoral politics. Like the Syriza in Greece or when Obama was getting elected in the US, the AAP too are trying to navigate the tension between hope and pragmatism, between idealism and politics. Beginning in 2012, as social uprisings spread like wildfire throughout the world, threatening to engulf the older, regressive political orders in several countries at once, India began simmering under its own spark of protest against the decades-long tyranny of corruption. New Delhi became a focal point of public’s anger against the status-quo, and soon one seemingly ordinary figure was at the centre of it all. His spectacular rise from a bureaucrat to an activist to a controversial, vigilante-politician grabbed the nation’s imagination. 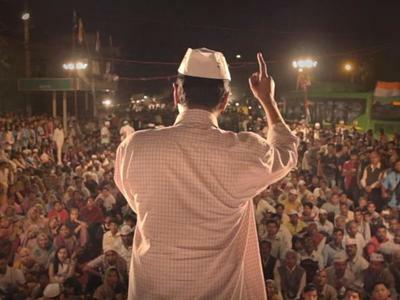 A non-fiction political drama now showcases, for the first time, the stunning journey of a unique group of protestors, led by Arvind Kejriwal, a controversial figure who carved out India’s newest political force—The Common Man’s Party (AAP)—and proudly termed himself An Insignificant Man. 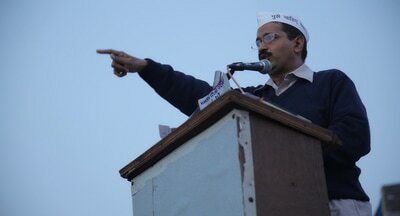 Arvind Kejriwal’s arrival on the political horizon dramatically upset the status quo. He sought to bring down old power structures not through ineffectual posturing, but through unconventional, strategic thinking. He took to the streets with documents that indicted the big players of the government. He stripped down the complexities of balance sheets to let the working class peek into the injustices concealed within. But while he was hammering at the foundations of India’s decrepit political traditions, internal conflict within his party emerged. His claim of participatory democracy was met with suspicion within his party; he was slapped the charge of being intolerant of other people’s ideas by even his closest colleagues. An Insignificant Man, is a living, breathing political study of the most turbulent phenomenon in India’s political landscape in decades — an event that continues to evolve. In witnessing the birth of the Common Man’s Party (AAP), the film journeys into a fledgling party’s inner workings and lays bare its strategies, tactics, and, most critically, its teething issues. The central conflict in the film is the battle between idealism and politics. We witness the thrilling transformation of a social movement into to a political party in an incredibly complex political landscape. Arvind Kejriwal (b. 1968) is a tax official-turned-activist-turned-politician. Having emerged as one of the architects of the Anti-Corruption movement in India, he decided to form a political party in 2012. A vastly polarizing figure, he is currently the Chief Minister of Delhi. Kejriwal graduated from one of India’s leading colleges and joined the Indian Revenue Services in 1990. Tired of the corruption within the government, he resigned and started an anti-graft forum. In 2006, he won the Ramon Magsaysay Awards for his activism. Over the years, his struggle against corruption led him to believe that the most immediate solution is a strong anti-corruption bill which acts against holders of public office. Kejriwal and other activists drafted the bill and took to the streets of Delhi in 2010. The campaign for the bill captured popular imagination and shook the foundations of the political class, which at first made conciliatory overtures to the campaign, but backed out when the threat to their well-being became real and imminent. Over the following year, we followed Kejriwal as he went about the controversial decision of building a political party. The film sees Kejriwal battle nepotism, dogged opposition both within and without, and the pull between what is right and what is necessary. Yogendra Yadav (b. 1963) is an Indian politician, psephologist and academic. Until 2012, he was a popular face on news channels, providing expert analytical insight into elections in India. He has published various books and articles on the same subject. Over the years, he has been a part of various social movements that failed to make a successful transition into politics. In 2012, he formally joined the anti-corruption movement as it transitioned into the Common Man’s Party. Yogendra Yadav helped bring academic rigour to the party’s ambitious plans. At various points during the campaign, Yogendra conducted specific polls within Delhi to understand public issues and the party's approval ratings. He played a pivotal role in drafting the party's manifesto, building a charter around the expectations from the party. This occasionally put him at odds with Kejriwal in the tussle between theory and implementation. Santosh Koli (b. 1985) was a Common Man Party candidate from the Seemapuri constituency in New Delhi. Santosh began working with Arvind when he set up an office in her neighborhood of Sundernagri, a low-income area on the outskirts of New Delhi. Over the years, she became a key member of his team. She campaigned actively for the rights of the lower classes and was routinely harassed by local mafia. In 2006, the food grain mafia, irked by her campaign to deliver food ration officially allotted to the poor, brutally assaulted her. Santosh’s fiery activism saw her win various awards. When Arvind went on a hunger strike to galvanize people over the graft in the Delhi government’s electricity & water policies, he chose to live and operate from Santosh’s house in Sundernagri.